Musicians play music. That seems obvious. However, playing music isn’t about a paycheck, gigs or recordings. Musicians play music because that is what musicians do. It’s self-expression, exploration of personal potential and the need to communicate with other musicians. These desires inhabit everyone who feels connected with playing an instrument. In order to develop these desires into a professional musical career, any talented student of music must be focused, organized and dedicated to this goal. This includes spending a lot of time in the practice room. The following paragraphs offer tips for making music in the practice room. Make music everyday. Dr. Shinichi Suzuki’s violin method encourages students to “practice only on the days they eat.” This simple suggestion is intended for young children to make music part of their regular daily routine. For high school and college students this means the development of time management skills. Busy class schedules and assignments can easily take priority over practice time in a student’s day. Look ahead and schedule practice time on your calendar everyday of the week. Then sit down and decide your musical goals for the week. How will you divide your lesson assignments into your scheduled time slots? How will you organize your time for different percussion instruments? When will you work on ensemble music? Sight reading? Technique? These types of questions will help you to develop your weekly plan. Write your goals in a notebook and revise them as needed. Keep this notebook with your mallets and stick bag and share your goals with your teacher. The best goal you can set is the one for the present. As the practice room door closes and you are standing in front of the instrument ask yourself, “What am I doing right now?” An answer could be “Perfecting these eight bars before my next class.” Mindless practice will not make anything perfect. Long term and short term goals will help you to define your musical direction. It can be easy to waste time in the practice room and not address all of your goals for the day. A great way to organize your time in the practice room is the use of a simple digital kitchen timer available from any Wal-Mart or Target store (usually around $5). These timers can be set for the overall practice period and can also be set for smaller sections of time within your practice period. This way you can make sure you cover all of your goals. For example, you have 90 minutes to practice and you have three areas of music to cover. By setting the timer to three 30-minute periods you guarantee that you will spend time on each of these sections. When the timer goes off, you have to go on to the next section of the music. If you need more or less time on one of the areas, then make adjustments in your next practice session. Most students dive right into a new composition after it is assigned by their teacher. The obvious goal is to quickly learn the notes and rhythms before the next lesson. However, this usually results in a weak performance of just rhythms and notes. Quality music has much more to offer than that. You would not eat a whole apple pie at one sitting, so don’t attempt the same process in the practice room. Once you have researched the composer, studied the score and understand the musical style of the composition, practice small sections of the music at a time. Define the expressive elements of the first phrase and attempt to shape your sound within the composer’s intentions. Once you feel comfortable, move on to the second phrase. After you have progressed through an entire section (or the whole composition), take a pencil and mark your most difficult phrase or section. This marking indicates where you should begin practicing. Work to make your weakest area the very best section of the work. Then move to the next “weakest” area. Record yourself practicing these sections on a regular basis for better self-evaluation. The following quote from Noah Adams’ book Piano Lessons illustrates this point perfectly: “ I am now looking you straight in the eye and I am speaking slowly and rather loudly: I believe in marking off, in every piece we study, all passages that we find especially difficult and then practicing these passages patiently, concentratedly, intelligently, relentlessly – until we have battered them down, knocked them out, surmounted them, dominated them, conquered them – until we have transformed them thoroughly and permanently, from the weakest into the strongest passages in the piece.” By consistently strengthening the weakest areas of your music, you will gradually be able to play the entire composition with confidence and ease. After you have given attention to each section of the music (each piece of the pie), then start to put the pieces together one by one. Continuity is the goal at this stage. Depending on the music and your background, you may reach this stage after weeks of practice or less. What is important is not the quantity of music you play at a given time, but rather the quality of what you play! Go slow! The development of musical expression and technique takes time. Expect the best of yourself and shoot for 100% of the notes in the practice room. If you cannot play all of the notes consistently within the musical framework on the page, then simply slow down. Slow practice can help you to focus on the details. Use a metronome to pace yourself and mark your practice tempos in pencil under each section of the music. Take every musical indication on the page into consideration. Concentrate on control and technique as if you were playing at performance tempo. Don’t be in a hurry to speed up. Instead, gradually increase the tempo as your confidence and accuracy grows. Although this process may at first seem to delay your progress, you will achieve performance quality quicker than attempting faster tempos with errors. Slow practice helps you to concentrate on tone and musical direction. It also ensures that you are confident and accurate within the stylistic intentions of the composer. Sometimes students will work on technical exercises from a method book for long periods of time. 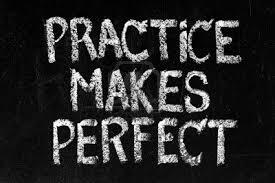 Slow practice will give you the opportunity to devise your own exercises from the music you are preparing. Choose those difficult eight bars from a solo or ensemble selection and create an exercise to help you play them better. Keep your practice focused on the techniques you need in order to play your music. There are more places to play music than in the practice room (thank goodness!). Students will often work for weeks on a solo marimba work or chamber selection and then only perform it once. Then all of those weeks of preparation are put away in the file cabinet and work begins on a new piece. This process allows for the student to miss an incredible opportunity to become a strong performer. Just as a work of music needs to mature in the practice room, it will also need to mature on the stage. Performing a work for the first time can teach the player a great deal of information concerning his/her performance tendencies. I recommend that performances be recorded so that students can listen back and ask questions such as: “Which sections rush? Is the balance and blend focused for the melody to be heard? Do my dynamic changes have real contrast? Does the tone of the instrument and direction of the music fit the composer’s intentions? Do I establish the mood of the music?” The work should then be performed several more times to allow the student to fine tune the composition. These repeated performances will allow the student to gradually become comfortable on stage and avoid excessive performance anxiety. Give yourself every opportunity to get in front of people and make music. After you have explored performance opportunities in your high school or college music program, try contacting civic organizations, churches, and community colleges. These organizations are often eager for students to come play and talk about their music and instrument. There are plenty of opportunities for performances if you take the time to make contact with these types of organizations. Each performance can help you to grow as a musician. Your music and your confidence will be stronger for the experience. If you are dedicated and persistent with your goals, there is really no limit to your level of success. President Calvin Coolidge once said, “Nothing in the world can take the place of persistence. Talent will not; nothing is more common than unsuccessful men with talent. Genius will not; un-rewarded genius is almost a proverb. Education will not; the world is full of educated derelicts. Persistence and Determination alone are omnipotent.” Coolidge’s point is clear: hard work and dedication will help you to achieve your goals. Contrary to popular belief, there are few rules to follow in building any career in music. You have to follow your heart and realize that the only limit you will encounter will be your imagination. If you can visualize or imagine how a certain piece of music could sound, then you will be well on your way to finding that sound on your instrument. Working with an established teacher can help expand your thinking, but in the end, each of us has to make our own decisions. We are responsible for our own education. This means we must take every opportunity to learn as much about our craft as possible. Find out as much as you can about your art and work for your own concept of sound and expression. Listen to a wide variety of music and explore new compositions with an open mind. Knowledge and research are powerful tools for the practice room. As you approach the practice room, do so with a sense of mission: to make music. Because that is what musicians do!